Demons make work for idle thumbs. 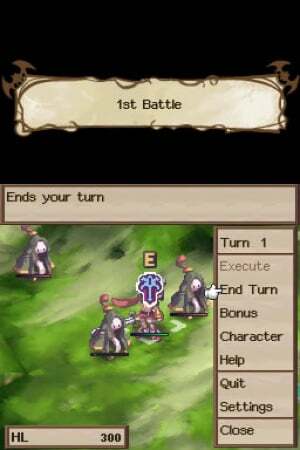 For those unaware, Disgaea DS is a remake of a PS2 turn-based tactical RPG that's gained cult classic status over the years. It follows the story of youthful demon, Laharl – the son of the late overlord – on his quest for dominance in the Netherworld. 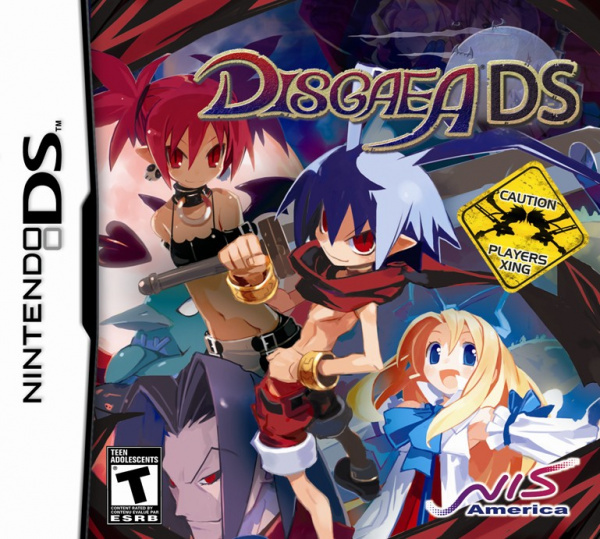 Held in high regard by many PS2 owners, Disgaea has finally brought hell to the DS – and about time too! Now, the concepts of tactics games are well established - Final Fantasy, Fire Emblem and Shining Force (happy James!? Yes, very happy! - Editor James) are some of the obvious examples to use. Units are placed on a battlefield divided up into squares; combatants take it in turns to move the units about the squares in order to attack and defeat the opposition. In more generic games of this type, you’d progress through a series of battles en route to the big finale. Disgaea, however, takes the conventional norm to the next level – the next 9998 levels to be precise! Instead of a few linear levels in the story mode, the game is packed to the brim with countless levels, battles, items and an unparalleled character creation system. 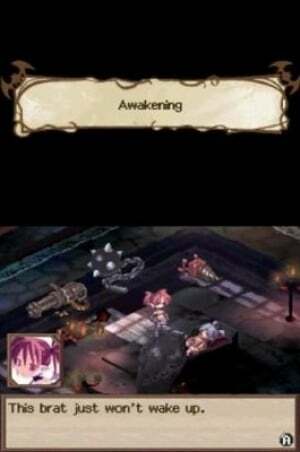 Disgaea’s story starts out a couple of years after the death of Laharl’s father, the overlord. After being asleep for a few years, Laharl is awakened by his vassal, Etna, who informs him of the chaos his father’s death caused in the Netherworld: demons are fighting it out to be the new overlord, and there are several sinister plots afoot involving angels, demons and the people of earth – our demonic prince has his work cut out if he is to claim his father’s throne and protect the Netherworld. Yet while fighting this battle he is engaged in a more personal one between his demonic and human sides; Laharl is on a journey to rediscover himself, albeit in something of an off-the-wall and light-heartedly humorous fashion. As expected, this journey involves a lot of battles, with most ranging from a walk in the park to some truly demonic encounters, and of course no amount of story can make up for a game that doesn’t play well at the core. Fortunately, Disgaea has one of the most addictive battle systems we’ve encountered to date. There is a large variance of characters with different types and kinds of attacks: archers, brawlers, mages and more, all with their own relative strengths and weaknesses. Combat follows the usual route of each side moving their units about before the other takes their turn, and with each battle being duked out on environments of varying terrain, combined with enemy AI that is well-tuned (most the time), you’ll feel sufficiently challenged. What really distinguishes Disgaea though is its system of Geo Panels: these are status-affecting objects that are activated when placed on coloured squares on the battle grid. Most levels will have a series of these coloured squares, and if you place a Geo Panel on one of these it will put that status effect across all the other same-coloured squares. Some of them will teleport you around the battlefield, others will damage your health, and then there are even some that makes the unit invincible. Including this element into the game really adds strategic depth – status effects can be your best friend or worst enemy – and the ability to destroy them in chained combos that damages enemies (and allies) and changes the colour of other squares makes them a real potent weapon for the strategists out there. You see, in the Netherworld things are quite political, which means most motions you will wish to pass (cheaper items, stronger enemies, more counter attacks, additional levels being opened, etc) have to be approved by the senators. Now, being demons (and politicians! ), they are a fickle bunch that is susceptible to bribes. Players are actively encouraged to take items with them to cater to the senators’ greed, and if they still vote against you, you have the option to use some persuasive force on them. To further your chances in the Dark Assembly, and make you more revered by the senators, you can take ‘exams’ that increase your rank. These exams are battles where the character is pitted up against several monsters – win the battle, and you rank up; lose, and it’s game over. The system really works well, and you’ll end up spending a lot of time ‘persuading’ them to see things your way. Probably the richest part of the Dark Assembly, though, is the ability to create characters. By taking an existing character to the assembly you can request for a new unit to be made, and, depending on how much mana your character has (gained though kills) and on which foes you’ve defeated in battle, you’ll have a choice of what unit to build. But it doesn’t just stop there: the character that created the new unit becomes its mentor, which means that they get exp gains from their underling’s kills and can harness their abilities in battle when they are adjacent to that unit (so a melee fighter could inherit the abilities from a mage). Then you also have reincarnation, which lets units start out at level 1 and non-story characters change class – you can even retain abilities from their class prior to reincarnation (meaning you can have a healing mage become a warrior, but keep the healing skills.) The strategy involved here is brilliant, and those stat-heads out there will spend ages working on the perfect permutations. It’s no real surprise then that playing through Laharl’s adventure in the Netherworld can either be a reasonably long affair, or an exceptionally long one. With stats galore, item levels, the Dark Assembly, and alternate endings that are tied in to how many things you have accomplished, Disgaea is potentially the most time-consuming title out there. For those wanting to go from A-B-C, there will be a lot of grinding, just not as much as those who want to get to level 9999 and get the game’s full worth. But this is the real beauty of Disgaea DS: you’re not forced into the extremely time-consuming full story, and the content is meaty enough for those not wanting an overly exhaustive experience. The only fault we really have is that it’s sometimes hard to know exactly just what there is to do – for instance, we only found out enemies could be thrown together to form a more powerful monster though a total mistake. A bit more cohesion in explaining the multiple facets of gameplay would have been appreciated. But with the potential to make a new game plus after completion, you'll certainly get the opportunity to hone your Disgaea skills – if you're willing to put the countless hours in! Truth be told, Disgaea is one of the richest experiences out there on the DS. With so much to do, it’s hard to put this one down short of 30 hours. It’s host to a superbly balanced combat system with real strategic depth; there’s some pretty decent visuals present, and it even features some quirky, bizarre, and innuendo-ridden moments. The only real downsides we had were the game’s sometimes cruel difficulty and the lack of full explanations of some of the finer points of battle. 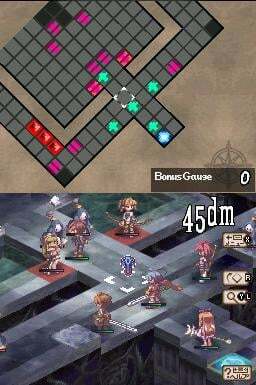 All in all, if you like your number crunching and thrive on these tactical RPGs, you’ll love Disgaea DS – just don’t expect to put it down anytime soon! Disgaea is a fun game for those looking for a serious SRPG and the DS version has a few neat bonuses like the Prinny commentary. I think Knights In The Nightmare has it beat in terms of the sheer OCD-esque amount of stats and mechanics present, but Disgaea and Nippon Ichi are still the benchmark for this sort of number-crunching excess. Nice review! Yeah, but let's face it... it isn't as good as Shining Force, is it? Dunno, I played Disgaea on the PS2 and found it pretty boring because of the need to grind a lot and the biggest features of the game being basically the ability to grind even more than in other games. Dood, that was an excellent review! I had the original for PS2 and I was considering getting it again on my DS. I think now is the perfect time to do just that! Oh man, another game on my wish list. I'm going to have so many I'll never get to play them all. I want to get into this game, but the grinding feel is much more than a Korean MMO, and that is ridiculous. Personally, I much prefer the FF: Tactics Advance (GBA) for my SRPG. To be fair the only SRPG I liked was Dawn of War 2. Great Review for a great game I got it & I loved it. The promise of the gameplay & cute anime girls lured me to the game. Yes I have a soft spot for cute anime girls. I almost got the PS2 version with the intentt of getting the DS version not knowing it's a remake. Glad I diddnt make that mistake but still I love the game. For everyone complaining about grinding, you really don't HAVE to to beat this game (and enjoy it, because the story and story fights are fun). Use the dark assembly to make all enemies easier and you won't have to do a single fight outside the main story. KDR_11k's first comment pretty much described my feelings towards the title when I played it on the PS2, which is why I didn't purchase the PSP version when it came out. When I heard that NIS would SOMEHOW cram the game onto a DS cart I had to pick it up no matter how boring the gameplay was - at least this time I would just play couple of maps at a time on the go. I even went several miles out of my way to grab the last sealed copy. The game suffers from the voice acting that made the PS2 version more enjoyable but the fact that they condensed a PS2 game down to a DS cart was great in itself. One note: pick up Double Jump Publishing's strategy guide if you want to get anywhere. Fantasia: I guess, I never really looked at the Dark Assembly options since I figured that'd only be useful much later. Then again most of my higher level characters are very low quality because I figured those 3-4 stat points less wouldn't have any noticeable impact, didn't know that gets amplified on levelups. I certainly will not bother with grinding up new characters just for that. Then again I'm already so tired of the game I'd probably only bother with reading a script of the storyline. I'll be getting this one. There aren't a lot of other Strategy games on the DS worth getting anyways. I have this on the ps2 and i've clocked maybe 70 or 80 hours and have still barely progressed at all. I just get totally absorbed in the Item World, and upgrading my characters and everything else there is it -- hell, I even spend time grinding "for fun" (the battle system is just that awesome). Let's not forget the fun times you'll have building up massive color chains and then find legendary items in the process. There just isn't enough free time to go around to accomplish all there is do. I took a break from the game because it was sucking up all my spare time, but if I had it on the DS (the PSP version is probably superior, to be honest, but I only have a DS), it'd be a lot easier to get things done in my downtime. A fantastic game that's worth every penny, but be PREPARED; if you're the OCD type who wants to do everything you can, this will quickly turn into one of the most intimidating games you'll ever come across. The sheer breadth of it is exasperating. No thanks. I'd rather get Disgaea: Afternoon of Darkness for the PSP. a much better version of the ps2. fast combat animation is a bless ! really. REALLY. but i question the fact to stay countless hours on a small screen. it can get your neck sore, your eyes sore, headache, on a tv screen and the couch, it just flow easily.